Alasdair Gillies – World’s Greatest Pipers Vol.12 1994 – King’s Taxes – A=476 Hz G=834,832,833 Hz -> Spot on 7/4(A) – funny he actually starts a tad sharp at 834, he underblows it a bit on the next one at 832 and you can hear the slight discord with the drones, and then on the third pass you hear him blow harder as he’s still underblowing it a bit at first to come in right at 833 Hz by the end of the note. Here I was, wondering about the Piobaireach high G. I was under the impression that the Piobaireachd high G was the 16/9 ratio to the fundamental coming in at ~4 cents flat of equal temperament. However, when I tuned my chanter as such (it would barely get sharp enough), it sounded pretty bad. However, Hugh MacCallum’s on his World’s Greatest Pipers album is awesome at the 4 cents flat tuning. So, I tuned the Piobaireachd high G by ear instead and found it tunes just where the light music high G tunes at ~31 cents flat, only it sounds different (sharper to my ear, of course, given my previous misunderstanding). Below you’ll find a mp3 of the normal high G followed by a Piobaireachd high G and also a fourier analysis of the time domain signal normalized to the fundamental high G note. 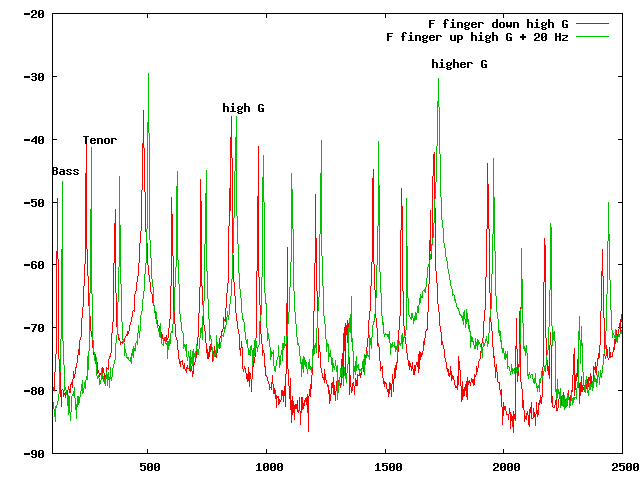 Note the Piobaireachd high G is in red and the light music in green; and because their spectra overlapped exactly (proving they both tune at ~31 cents flat) I had to offset the light music one (green) up 20 Hz to make it easier to see their relative ratios. Colin Kyo chanter, Gilmour reed, Gellaitry pipes with Redwood reeds. Edit: These pipes are currently for sale. They’ve got a bag, drone reeds, drone cords, and a matching Naill chanter to go with it. The chanter has a matching sole and is carved. The mounts have turned orange and the metal needs polishing – ferrules and slides. I’ll get a new post up soon with pictures and sound files of what the pipe will be supplied with. Of course, if you don’t want some of the things for a lower cost, they can be removed/subtracted. I think we’ve settled on $900 + shipping/insurance. But email or call to confirm/negotiate. Offers considered. Here I have for your listening endurement (I sorta messed up the recording [a bit drone heavy], I think the bass drone was sitting right in front of the mic) enjoyment some 4 parted 6/8 jigs. The Naill drone sound is so distinctive it caught me off guard and I forgot about the mic, that and I wasn’t playing too shabby, oh well. I talk a bit at first and fiddle about during the set, but if the pipes are still going there’s more tunes to hear. You’ll know the end as you’ll hear the owner of the pipes ask a question. :o) This recording probably shouldn’t be relied upon for determining what Naill drones sound like. Enough talk…or not! Turns out my iPhone headphones don’t work at all in my iBook G4, so the recording sounded terrible, through my headphones. So, now that I’m listening to it on my iPhone it sounds great! Yes, this is exactly what the Naill’s sounded like. P.S. Wygent tenor drone reeds. I’ll tell you the name of the bass if it’s okay with him.